Sedona is home to many fine restaurants, art galleries, hotels, bed and breakfast inns, and shops. And there are restaurants and shops to fit any budget. The close proximity to the Grand Canyon, Phoenix, Las Vegas and many National Monuments makes Sedona a natural place to stay and use as a base from which to explore Arizona and other attractions. Here are answers to your questions. And if your question isn't covered, send me an email and you'll get an answer quickly. Why are the rocks red? What is there to do in Sedona? Does Sedona have a busy season? How can I quickly learn about Sedona? How can I contact the Chamber of Commerce? What is the sales tax rate in Sedona? Are there campgrounds in Sedona? Are there RV parks in Sedona? What are the jeep rides all about? What are some activities for kids? Can I do a day-trip from Sedona to the Grand Canyon? What should I pack based on Sedona's weather at different times of the year? When and where are the best Fall colors? What is a Red Rock Pass and why do I need one? Where can I purchase a Red Rock Pass? How many hiking trails are around Sedona? Where can I get trail information? Can I take my dog with me on the trails? What should I bring with me while hiking? What should I wear while hiking? Where can I find a vortex? Where can I find information on relocating to Sedona? Sedona is located approximately 120 miles north of Phoenix and about 35 miles south of Flagstaff at the mouth of Oak Creek Canyon. Uptown Sedona (there is no "downtown" Sedona) is located at the intersection of State Route 89A and State Route 179. This intersection is now a traffic circle (a roundabout some would say) and is known as the "Y." With an elevation of 4500 feet, Sedona enjoys a moderate climate. From Phoenix there are two ways to arrive in Sedona, both of which provide outstanding views of the red rocks. For the first route, drive north on Interstate I-17 for 89 miles to Exit 285. Drive west toward Cottonwood on State Route (SR) 260 and turn right on to SR 89A. Drive 16 miles on SR 89A to Sedona. For the second route, drive north on Interstate I-17 for 98 miles to Exit 298. Turn left and drive north on SR 179 for 18 miles to Sedona. You'll pass through the Village of Oak Creek where you'll find shops and restaurants. If you drive north on SR 179 on a holiday weekend, you are likely to encounter a long line of vehicles heading into Sedona. So for busy weekends, I suggest you drive into Sedona using Exit 285, SR 260 and SR 89A above. Simply put, the rocks are red because of iron. Millions and millions of years ago (320 million to be precise) Sedona was under a sea of water. Time has left its marks on our red rock landscape. Over the last 300 million years, Sedona has been land under a sea, at other times it was a floodplain adjacent to the sea coast. When the great uplift of the Colorado Plateau created the Grand Canyon, there was also a cracking of the Earth in the Sedona area which carved out our canyons and eventually our streams and creeks. As the water moved through Sedona, it carved away layers of the soft red sandstone that had been deposited here in the sediment of ancient rivers. This created Sedona landmark red rock formations like Bell Rock, Cathedral Rock, Coffee Pot Rock and more. There are many things to do while visiting Sedona. Because the weather is so mild, outdoor activities are plentiful, including hiking, cycling, camping, fishing, golf, horse back riding, and picnicking. There are a number of art galleries and shops that offer unique one-of-a-kind items. Sedona's proximity to major attractions makes sightseeing a wonderful experience. It is only a two hour drive to the Grand Canyon. Sedona is a beautiful destination year-round. The most popular seasons are mid-February through June and September through December. Lodging rates are slightly lower in July and August, but the most economical prices of year are available from the first week of January to mid-February. The days between Christmas and New Years can be busy as well. If you haven't yet arrived in Sedona, contact the Sedona Chamber of Commerce and request a copy of the Experience Sedona Guide. It contains a lot of information about Sedona. The Sedona Chamber of Commerce Uptown Visitor Center is located at the corner of State Route 89A and Forest Road at 331 Forest Road. The GPS coordinates for the Visitor Center are: 34� 52.119' N; 111� 45.702' W. The Visitor Center is open from 8:30 am to 5:00 pm seven daays a week. Closed for Thanksgiving, Christmas and New Year's Day. The Sedona Chamber website address is: http://www.sedonachamber.com/. Or call them at (800) 288-7336 or (928) 282-7722. The population of Sedona includes the City of Sedona and the Village of Oak Creek and is approximately 20,000 residents. 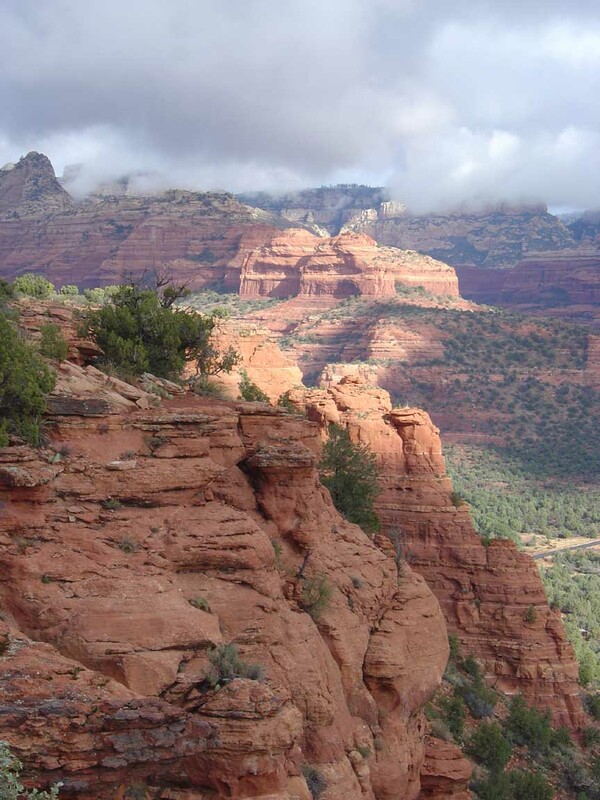 The city of Sedona sits in two Arizona Counties; Coconino and Yavapai Counties. As of March 1, 2018, the sales tax rate for Sedona businesses located in Coconino County is 10.4% . As of March 1, 2018, the sales tax rate for Sedona businesses located in Yavapai County is 9.85%. Backpacking is permitted in the wilderness area, which essentially is 5 miles or more from the City of Sedona. In the Red Rock-Secret Mountain Wilderness and Munds Mountain Wilderness, hikers must be at least 1 mile from the trailhead before camping. In Sycamore Canyon Wilderness, camping and campfires are prohibited at and downstream of Parsons Springs. On the West Fork trail, camping is allowed 6 miles in from the State Route 89a trailhead. Swimming is required to reach the camping area. There are other areas where camping is permitted around Sedona. Call the District Ranger Station at (928) 282-4119 for additional information. Yes, there are private RV parks in the Sedona area. Contact the Sedona Chamber of Commerce to obtain a list of RV parks. While you are in Sedona, you may want to go on a jeep/Hummer tour. There are a number of off road tour companies in Sedona. They take you off the beaten path, to places where you wouldn't drive your vehicle. The guides are well versed in the area's history and point out the various names of the rock formations around Sedona. Additionally, some of the tour companies offer tours to Indian ruins, others offer Vortex tours and others offer thrilling rides down steep embankments. It's an experience you won't want to miss. If you are staying at one of the major resorts, they may offer you discount coupons for your tour. Activities for children are numerous. Mountain biking and hiking some of the trails along water are very popular. Swimming at Slide Rock State Park or observing nature at Red Rock State Park can satisfy. A train ride on the Verde Canyon Railroad is a fun way to spend a day. A trip to Out of Africa Park to observe the lions, tigers and giraffes is an experience they shouldn't miss. And an evening at the Blazin' M Ranch for an all-you-can-eat buffet followed by a hilarious cowboy show will surely please everyone. Absolutely! Just 119 miles separates Sedona and the Grand Canyon South Rim. About 2 hours from Sedona (although you may want to include some additional time), you can see some of the world's most awe-inspiring sites on a single Grand Canyon tour. I suggest you enter the Grand Canyon from the east side by driving north of Flagstaff on State Route 89 toward Page, Arizona then turn west on State Route 64. You won't encounter the crowds like at the south entrance to the Grand Canyon and you'll be able to stop at Desert View just inside the east entrance for what I believe to be the best view of the GC. When we get snow, it is typically gone in a day. But if you are here for a snowfall, you'll be outside taking photos of the red rocks with the snow on them. Because of the 4500 foot elevation and the typically dry climate there aren't many deciduous trees to make the fall a colorful experience. But where there is water there is color. The third week of October typically brings color to Oak Creek Canyon, particularly the West Fork hiking trail, which is some 10 miles up Oak Creek Canyon at elevation 5500 feet. As the days go by, the color descends down Oak Creek Canyon, arriving in Sedona around the first or second week of November. The Red Rock Pass program was started several years ago in the area around Sedona. The funds raised through the program are used by the Forest Service for trail development and maintenance. If you park on the National Forest Around Sedona you'll need a Red Rock Pass or it's equivalent. If you park on private property (not the National Forest land) or you are going to be just driving around the area, or stopping to take a photo and you are near your vehicle, you do not need a Red Rock Pass (or equivalent). So to park on the National Forest, say at a trailhead to take a hike, you'll need to display in your vehicle a Red Rock Pass or equivalent. The equivalents are the National Parks Pass (also know as a Federal Interagency Annual Pass, which costs $80), the Senior Pass (also know as a Federal Interagency Senior Pass, issued to U.S. Residents 62 years of age and older), and the Federal Interagency Access Pass (issued to handicapped individuals and is free). If you don't have one of the equivalent passes, you'll need to purchase a Red Rock Pass to park on the National Forest. The Red Rock Pass is available as a daily pass for $5 per day, a weekly pass for $15, or an annual pass for $20 or $40. The daily pass lets you park on the National Forest for the day of issue. It expires at midnight. It does not include the parking fees at the 3 fee areas below. The weekly pass lets you park on the National Forest for 7 days and does not include the additional parking fees at 3 fee areas: Crescent Moon Ranch/Red Rock Crossing ($10 fee), the West Fork Trail ($10 fee), and Grasshopper Point Picnic Area ($8 fee), The parking fee for each fee area is separate (each area charges separately). The $20 Annual Pass lets you park on the National Forest for 1 year. It does not include the parking fees at the 3 fee areas above. The $40 Grand Annual Pass lets you park on the National Forest for 1 year and includes the parking fees at the three areas above. The Grand Annual Pass is available at the Red Rock Ranger Station Visitor center and the Sedona Chamber of Commerce Uptown Visitor Center. Red Rock Passes are available at the Sedona Chamber of Commerce Uptown Visitor Center, The Forest Service Ranger Station and at many businesses in Sedona. Daily and weekly Red Rock Passes are also available at trailheads that require a pass and National Forest locations (credit card only). Approximately 80 hiking trails are listed in the "Recreation Guide to Your National Forest" published by the Coconino National Forest Ranger District. There are other trails not listed in the Recreation Guide and described in hiking books available in Sedona, or listed on the website, https://greatsedonahikes.com. Up-to-date trail information is very important for a successful hike. For your safety and enjoyment, please obtain a copy of Great Sedona Hikes hiking guide available HERE. Trail Information can be obtained by stopping in to the Chamber Uptown Visitor Center or the Forest Service Ranger Station located just south of the Village of Oak Creek, on State Route 179 also provides hiking information. And the website https://greatsedonahikes.com has information and photographs for about 60 of Sedona's hikes. Many people come to Sedona to hike in the National Forest for the solitude it provides. Hiking alone can provide that solitude. There isn't much danger of violence on the trails. But the issue is if a lone hiker becomes lost or injured while in the forest. So we always recommend that you hike with a friend. And let someone not with you know where you are hiking and when you plan to return. Each year the emergency response teams are called out to rescue stranded, injured hikers. You should not hike alone. Yes, you can have animals on the trails as long as they are on a leash. You cannot take animals, even if leashed, in to the V Bar V Petroglyph Site, the Hoanki or Palatki Indian Cultural Sites, or any place where an "accident" has the chance of destroying the site. And please, clean up after your pet. Hiking in the forest is not risk-free. You should be prepared in the event of an emergency. You should have a hat, sunscreen, hiking boots, a first aid kit, map, flashlight, rescue whistle, compass, pocket knife and extra food. Additionally, all hikers MUST carry water. One gallon per hiker per day is recommended. Dehydration is one of the biggest dangers when hiking. While hiking you should wear a hat, hiking boots, clothes appropriate for the season and sunscreen. Hiking boots are recommended because the trails in Sedona are typically rocky, uneven with cactus sometimes growing near or on the trail. It is easy to twist an ankle without proper ankle support. Sedona is known in some circles as an area that has hot spots of natural energy called vortexes that draws thousands of visitors each year. They are believed to create positive, negative and neutral releases of the Earth's energy. Individuals who are receptive to these energy fields experience balance, a heightened sense of awareness, an awakening of the spirit or even divine intervention. A more detailed explanation is here. There are 4 main vortexes in Sedona, although some individuals can feel the energy in many areas around Sedona. The 4 main vortex site are: Cathedral Rock, Airport Mesa, Boynton Canyon and Bell Rock. You'll be parking on the National Forest to explore the vortexes so see the section on Red Rock Passes above. If you'd like a practical guide to finding where the vortexes are located as well as background on what a vortex is, you may want to purchase one of our Hiking the Vortexes books. They have the same content, but one is printed in full color ($13.95); the other in black and white ($10.95). They are explained in more detail here. Relocating to Sedona is a life-changing experience. many who visit Sedona (including my wife and I) caught "Red Rock Fever," a condition well known by the locals. It is explained in our book, Sedona Relocation Guide. In this book, we've included answers to questions you may have about relocating to Sedona, or investing in Sedona real estate. More information is available here.